1. The RM1,999 deal will unlock at 10pm, 25 Sep, and 10am, 26 Sep, sharp. The pricing may not refresh fast enough so it is better to click on the Samsung Galaxy Note 3 product link/listing (white or black) and keep refreshing that page, leading to the launch time. 2. Log in to your ebay.com.my account early. 1. Strictly while stocks last. First come first served. 2. Maximum 1 unit per buyer. Additional units purchased under the same eBay account will be void. Judging from the response this morning, do tune into the special link earlier and refresh the product page, not the main page. Hit the break for more information including the details for this morning’s deal. What’s happening @ eBay DEALS? There will be limited units only on a first come first served basis. After promotional units are sold out, the Samsung Galaxy Note III 32GB LTE will be priced at RM1,999 on eBay DEALS. 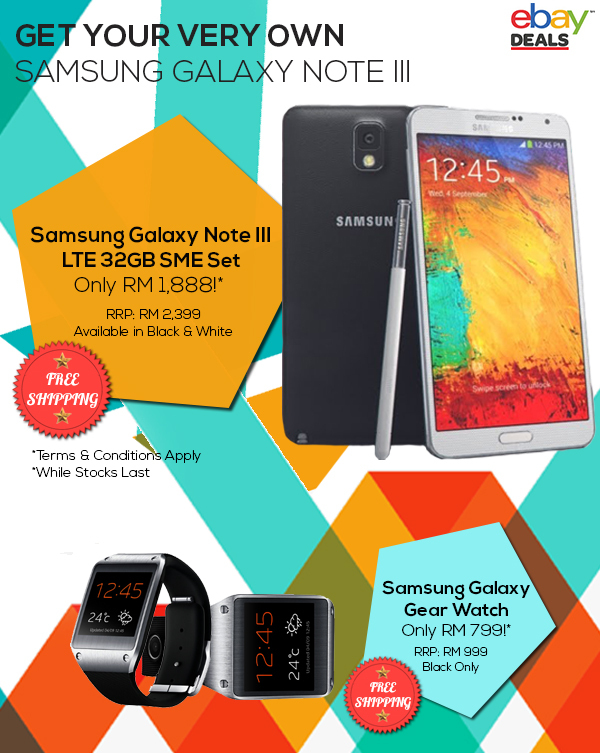 Lowyat.net will get exclusive sale units of the Samsung Galaxy Note III 32GB LTE @ RM1,888 each. Limited to 10 white versions and 10 black versions. First come, first served. While stocks last. Limited to 1 purchase per user only. Lowyat.net exclusive sale will only go live on a hidden URL (http://bit.ly/1aPYjdo) at 9am, Wednesday, 25th September 2013. Purchases can only be made from that launch date/time onwards. There’s no need to rush for sale units against the masses. After the unbeatable priced units are sold out, the Samsung Galaxy Note III 32GB LTE is on http://deals.ebay.com.my at a special promotional price of RM1,999, still way below market price. While stocks last. eBay DEALS also has a special for the Samsung Galaxy Gear @ RM799 during the promotional period. As some of you have asked in our comment section in our previous post, eBay Deals will only accept PayPal payments. Delivery will usually take up to 7 days. All deliveries are secure and you will be provided with a tracking number. As suggested by eBay Malaysia, the DEALs page might not refresh fast enough, you you’d better get the direct link to the device so you can keep refreshing it. The eBay Deals for the Galaxy Note 3 is already up on their page but the price will change at 9am sharp to RM1,888 so what are you waiting for? Visit eBay Deals now and good luck! Hit the break for the FAQs. 1. Are these original sets? Yes, the Samsung Galaxy Note III 32GB LTE mobile phones and Samsung Galaxy Gear sold on eBay DEALS in this launch campaign are original SME sets. 2. Why are the prices so attractive? The eBay DEALS (http://deals.ebay.com.my) team work directly with local and international sellers on ebay.com.my to always deliver the best discounts and free shipping on the hottest products. It’s a perpetual sale all-year round @ eBay DEALS. 3. Are there delivery charges? No, all items featured on eBay DEALS come with free shipping. 4. Can I self-collect the phone? The pleasure of shopping online is that goods are delivered right to your doorstep. There are absolutely no queues, no parking issues, no traffic jams and no crowds! So goods bought on ebay.com.my are always delivered. 5. Would there be more sales/promotions like this? Absolutely! Keep on checking eBay Malaysia’s homepage @ www.ebay.com.my and eBay DEALS @ http://deals.ebay.com.my for upcoming sales. You could also ‘Like’ eBay Malaysia’s Facebook page for updates.